When someone has a severe allergy, the life-threatening effects of an exposure are nearly instantaneous—skin rash, fainting, labored breathing, weak pulse, racing heart. This response—anaphylactic shock—has a straightforward cause and effect. But underlying that process has been a physiological puzzler: How does this massive reaction happen so quickly? Researchers at Duke Health, publishing in the Nov. 9 issue of the journal Science, used mouse models to track how immune cells are triggered during anaphylactic shock. They describe a previously unknown mechanism in which a newly identified immune cell basically mines the blood vessels for allergens and then utilizes an unusual mechanism for rapidly delivering the blood-borne allergens to mast cells. The finding potentially opens innovative lines of attack to shut down this deadly over-reaction that afflicts one in 50 people a year in the United States. "The central finding is that dendritic cells, which are key players in allergy development, also play a direct role in triggering anaphylactic shock," said senior author Soman N. Abraham, Ph.D., professor in Duke's Departments of Pathology, Immunology and Molecular Genetics & Microbiology, and member of the Program in Emerging Infectious Diseases, Duke-National University of Singapore, Singapore. It is understood that mast cells are the main actors in anaphylactic reactions as they engage in what's called degranulation—the release of histamines and other inflammatory substances into the blood stream, leading to systemic shock. 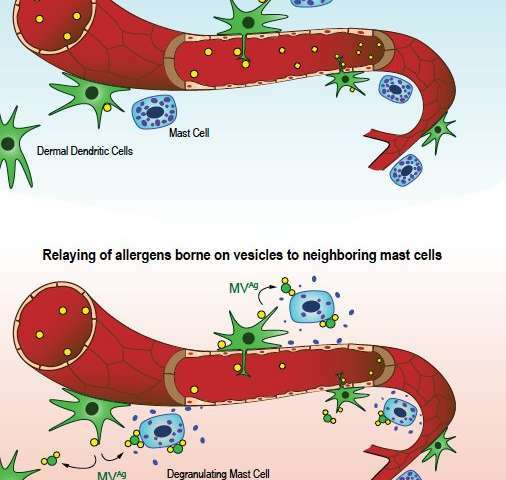 But it was previously unknown how mast cells, which are located outside of the vascular system, were alerted to an allergen circulating in the blood stream. What Abraham and colleagues observed was a newly identified subset of dendritic cells located on the exterior surface of blood vessels. Using probe-like protrusions called dendrites that drill into the blood vessels, these cells continuously sample the blood for foreign invaders. When the dendrites sense blood-borne allergens, dendritic cells alert the neighboring mast cells to the presence of the invader. This communication is unusual, involving a time-saving process of handing over the allergen through micro-vesicles, little allergen-coated bubbles, which bud off from the surface of the dendritic cells. "In addition to their well-known capacity to internalize, process and present antigens to immune cells, dendritic cells now appear to actively distribute antigens they have acquired to surrounding immune cells even before they are internalized," said first author, Hae Woong Choi. 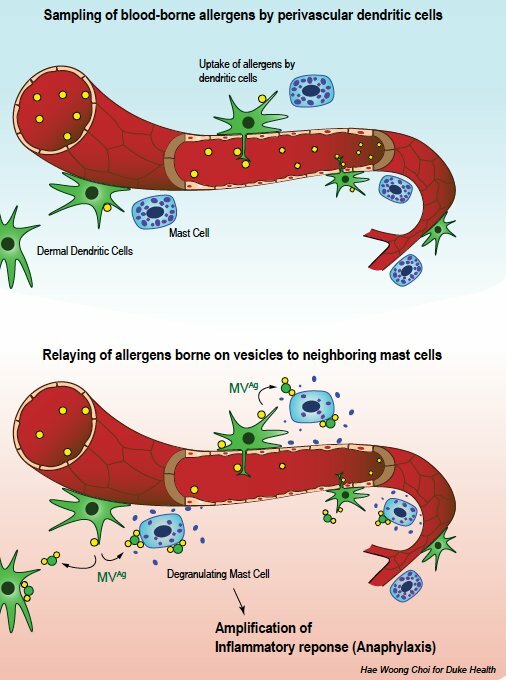 As these allergen-bearing vesicles make contact with mast cells throughout the vasculature of the body, a torrent of inflammatory mediators are released into the blood stream, quickly resulting in anaphylactic shock. To further demonstrate the dendritic cell's critical role in promoting anaphylactic shock, the researchers were able to deplete these dendritic cells in mice, curbing the allergic reaction. This new observation could lead to the development of new therapeutics targeting dendritic cells. Additional research is needed to explore whether this newly described activity of dendritic cells has an unknown benefit. "While it's detrimental in the context of allergens, this function might be needed to fight diseases and actually be helpful," Abraham said. "Maybe these dendritic cells are designed to detect blood-borne parasites, viruses or bacteria, so we need to understand any other circumstances that activate them before contemplating shutting them down or impeding their activity."